The summer anime season has come in hot, almost as hot as the abnormally high temperatures we’ve been seeing around the world this year. You know what else it hot? The human body, sitting at a healthy temperature of 97F and 37C. 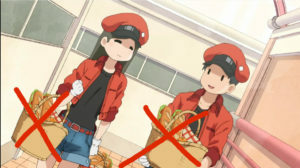 What a coincidence that we have a show airing this season that combines both in the form of Cells at Work! The premise is rather self-explanatory. You take the various cell types in the human body, such as red blood cells, white blood cells, and more, anthropomorphize them into cute anime characters, then watch them deal with the never-ending task of keeping our body safe from bacteria, viruses, and everything in between. 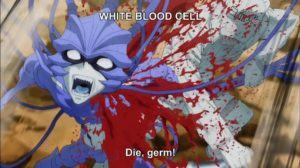 Comparisons to the early 2000’s movie and cartoon series Osmosis Jones are inevitable, but it’s clear after a single episode that Cells at Work! revels in the kind of zany kookiness that only an anime can provide. Obviously, some creative liberties have been taken to instill the “fun” part of the show, but Cells at Work! is still rather on point when it comes to the broad strokes of cellular function. What about beyond those broad strokes, though? Just how accurate are these cellular depictions? Never did I think there would come a day where I could apply my knowledge from working in the biomedical field to anime, but here we are. We won’t go into too much detail here, both for your sake and my own (I already took my classes once, I don’t need to relive that again), so take a seat, kick back, and let’s learn about the human body through anime! We’re starting with the most basic of basics here, the cell type that just about everyone is most familiar with. Red blood cells (RBC for short) is the most common cell type in the human body and make up approximately 40% of blood’s content. Cells at Work! makes this abundantly clear by the sheer number of red-uniformed oxygen carriers that can be on screen at once. As the show states, RBC’s primary role is the transport of oxygen throughout the body, as well as carbon dioxide to the lungs to a lesser degree. It’s here, though, that the first discrepancy between the anime and reality crops up. We see them transporting not just oxygen, but nutrients as well. It’s true that the bloodstream transports nutrients such as vitamins, minerals, and carbohydrates throughout the body, but RBCs aren’t the ones doing the transporting. Instead, those nutrients are diffused throughout the liquid portion of blood, plasma, which makes up most of the other 60% of blood content besides RBCs. Depicting this detail in Cells at Work! probably would have been more work than it’s worth since most people associate RBC’s as blood itself in most cases, but it’s still worth pointing out. Besides that, RBCs are rather cut and dry. Their function is so simple and straightforward that it’s difficult to really get anything wrong. We can speculate on how the show will utilize other aspects of RBC’s not touched on yet in creative ways, though, such as blood type. Blood type is determined by the type of antigens, markers of sort to put it simply, present on the surface of RBCs. When RBCs with a different antigen from the body’s own are introduced (Type B blood into a Type A person, for instance), the immune system will interpret it as a foreign substance and attack it, which is why blood typing is so important during transfusions. Cells at Work! RBCs don’t seem to be displaying anything that would resemble these antigens at first glance, but it’s not difficult to imagine how such a situation would play out in a comedic way. Foreign RBCs being racially discriminated against by the native RBCs is just the kind of absurdity we could expect at this point. The only catch is that the series seems averse at dealing with any severe or life-threatening conditions, of which a blood transfusion usually implies, so chances of such a homicidal portrayal ever happening seems low. The other, and arguably more interesting, protagonist of our series (there’s only so much you can do with a red blood cell) is our frontline specialist, the neutrophil. They’re often referred to as white blood cells, but WBC is actually a broad category containing numerous cell types, including neutrophils. Neutrophil’s depiction as a psychopathic killer with a one-track mind for murder is actually pretty spot on since, unlike their macrophage and dendritic cell compatriots, they have one role and one role only: To search-and-destroy any and all foreign substances in the body. The “search” portion is carried out utilizing neutrophil’s receptor, which we saw in the first episode. This pattern recognition receptor recognizes a broad spectrum of molecular patterns commonly found on pathogenic surfaces. This allows the neutrophil to bind to its target and that’s when the “destroy” portion begins. I hate to break it to you, but they do not accomplish this by slicing and dicing invaders with a razor-sharp combat knife, as hard as that may be to believe. Instead, neutrophils, uh, neutralize bacteria and other invaders through a process called phagocytosis. The simplest way to describe phagocytosis would be comparing it to consuming and digesting something. Neutrophils will bind to and engulf a foreign bacteria. Once the bacteria is fully surrounded, the neutrophil releases toxins into and modifies the acidity of the chamber to completely degrade its target. Bacteria with cell capsules, like our good friend pneumococcus in the first episode, are resistant to this process because the capsule acts as a shield that makes it difficult for the engulfment process to happen. Individual neutrophils can only carry out this phagocytotic process a limited number of times, though. Like bullets in a gun, once they’ve used up all their granules which are capable of phagocytosis, neutrophils lose their weapon and essentially become dead weight, literally. After serving their purpose they simply die out. Dead and dying neutrophils are actually a major component of pus, that wonderful white substance that oozes from wounds as they heal. Alright, let’s get this out of the way, first and foremost. It’s going to break all the platelet lovers this show has birthed, but brace yourself as this must be said. Phew, saying that hurt me just as much as it surely hurt you, but now we’re past that. Instead of cells, they are considered cell fragments that broke off from a larger cell type called a megakaryocyte. 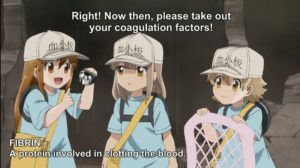 As the show depicts, and is common knowledge for most, platelets’ primary function is the clogging of wounds to minimize bleeding. Due to platelets’ positively tiny size (about a fifth of the diameter of an RBC), they are shoved to the outer edges of the blood vessel by other larger cells. 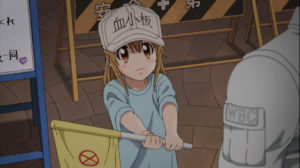 We see the opposite of this in the second episode when Red Blood Cell-chan and White Blood Cell-san make room for a parade of hard working platelets, but can you blame them when the little suckers are so damn cute?! Since platelets are found predominantly along the walls of blood vessels, that also means that they are mainly the first to come into contact with any sort of rupture, contrary to the delayed response the second episode may lead you to believe. Once platelets reach a wound, they become activated and spindly appendages branch out from their original disc-like shape to anchor them to the wound. They then secrete chemical signals that attract other cells in the vicinity that, in conjunction with fibrin and coagulation factors, form the fibrin clot which will eventually dry into a scab. We saw many a generous cell donate their bodies to the clot in the second episode, but none of the platelets. The sad truth of the matter is that platelets are not spared and their cute little selves are fated to shrivel up with the rest of the cells caught in the clot. This breaks the hearts of many of you, I’m sure. This is where things start getting a little more nuanced with the immune system. Macrophages are still part of the body’s innate immune response, the part that provides continuous, non-specific protection from pathogens, but they’re more multifaceted than the simple-minded neutrophils. Like neutrophils, macrophages also have the task of eliminating microbes through phagocytosis, but their role doesn’t end there. They also have the task of obtaining the specific antigens of the microbe, its markers per se, and presenting them to other cell types in the adaptive immune system, which we’ll talk more about later with dendritic cells and T cells. While there’s no way for macrophages to present this antigen info remotely, as was shown in the third episode, what they can do in a remote fashion is induce the inflammatory response. By secreting special chemical signals called cytokines, macrophages can recruit more neutrophils and the like to the site of infection. 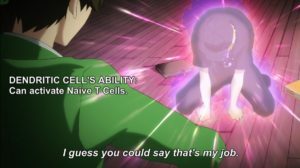 In the show’s case, the maid’s walky-talky is essentially acting as the cytokine which called for back up to fight against the army of flu-infected cells. This inflammatory response is one of the many reasons fever temperatures develop during illness. Cells at Work! is right to dress macrophages in maid attire, as they also have the responsibility of clearing cell debris. During an immune response, cells and pathogens alike are dying left and right and it’s the macrophages’ jobs to make sure their dead bodies don’t clutter the area. An excess of apoptotic and necrotic, essentially dying, cells can potentially lead to exacerbated inflammatory responses. The maid uniform is about the only indication we get of this function in Cells at Work!, though, as they are shown making a bigger mess than there already was rather than cleaning up said mess. Go figure. Rounding out the phagocytic cell types of the innate immune system we have the dendritic cells, or DC for short. DCs have a similar function to macrophages in that they also phagocytize invading bacteria and capture antigens, but they lack the cell debris clearance function. Instead, DCs lean more towards the latter antigen aspect and are even known as “professional” antigen presenting cells within the field of immunology. Without getting too bogged down in details, the professional moniker means that DCs have the machinery necessary to effectively activate T cells as part of the immune response. Macrophages are also classified as professional antigen presenting cells, but the fact of the matter is that the vast majority of T cells are activated by DCs during an immune response. 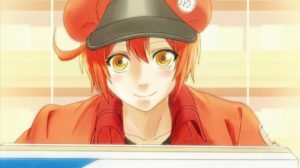 We see this activation process happen during the third episode of Cells at Work!, in what is one of the most glaring discrepancies the show has displayed thus far. 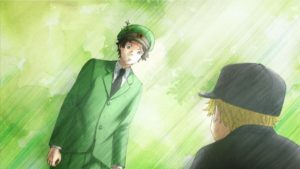 We saw diligent Dendritic Cell-san cheering up poor, little Naive T Cell-kun, eventually encouraging him to activate and take on the influenza scourge. That’s all well and good for giving a nice “never give up” moral to the story, but something important is missing from this scene and you can probably figure out what at this point. The all-important antigen that incites this whole process is nowhere to be found! If T cells are activating without a foreign antigen that could spell serious problems as they are potentially activating off a native antigen and triggering an autoimmune response; that is when the immune system attacks healthy cells instead. Very bad news. This process also doesn’t show DC’s trademark costimulatory properties that distinguish them from macrophages as the de facto leader in T cell activation. There’s also an issue with how Naive T cell is portrayed, but we’ll save that for when we talk about T cells specifically later on. All in all, a touching scene, yet one of the more misleading in the show. Obviously there is a lot we didn’t touch on, and the immunology rabbit hole runs deep, but hopefully this helps shed some light on an otherwise just plain, fun show. Your homework is to be caught up with Cells at Work! for the next class, which can be watched on Crunchyroll. This material will be on your test! Are you saying that anime lied to me? That’s it, I’m done. Great article, Matt! Japan never ceases to amaze me with what it will make shows about. Now if somebody makes a series about putting on theatrical productions, I can have my time in the spotlight (dohohoho). I loved reading through subject matter you’re clearly passionate about. 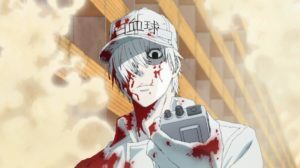 Have you checked out ‘Cells at Work: Black’? It’s a spinoff manga that’s supposed to take a look at an unhealthy human body. Def can’t wait for your next installment! Actually this show have depiction about Phagocytosis of Neutrophils and Macrophages. Since it’s not gonna look so well for them to engulf the pathogens while battling, they will eat them after they finished up with them. In ep 7 the macrophage was stirring in a giant pot that has a Staphylococcus aureus inside.